Fabiola Santos from University of Londrina, Brazil, is working on the Chromosomal evolution and the organization of repetitive DNA sequences in diploid and polyploid Brachiaria forage grasses in the molecular cytogenetics group in Leicester. Brachiaria is most important cultivated forage grass genus in Brazil (with billion-dollar production), and the genus includes diploid and polyploid species with similar and small chromosomes and basic numbers of x=6, x=7 and x=9. Many are apomictic and may multiply vegetatively. 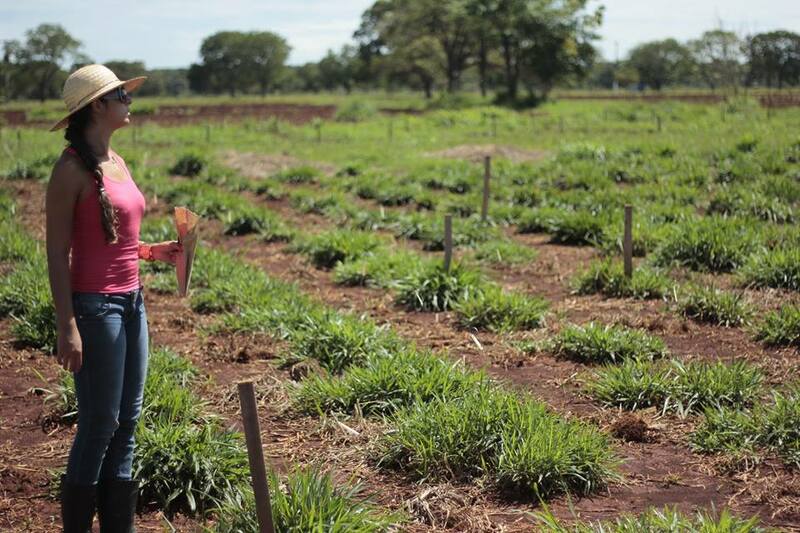 Fabiola is studying the genome structure and the monoploid complement to provide information about the origins of the polyploids and structure of the genome. In particular, using bioinformatic and molecular cytogenetic methods, she is exploiting rDNA, microsatellites, tandem repeats and transposable elements to characterize major genomic components, and to identify chromosomes by in situ hybridization. Questions include What is the monoploid complement – x number – for Brachiara? What is the distribution of retroelements and microsatellites across the genomes? Can we develop probes that allow identification of many individual genomes and chromosome types – with either localized probes or whole-chromosome paints? 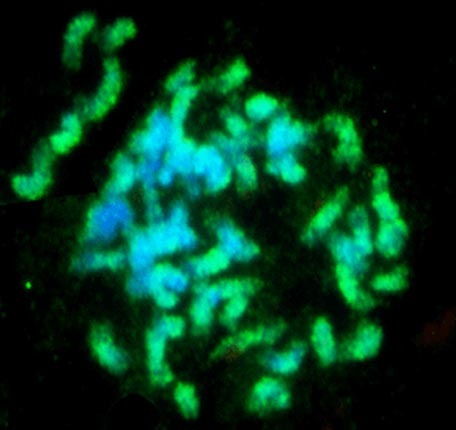 Brachiaria bryzantha chromosomes (2n=4x=36) stained blue with DAPI and showing some chromosomes with less labelling with a retroelement probe. As well as developing karyotypes and understanding processes of genome evolution and speciation, the results will assist breeders in characterization of interspecific hybrids. Her preliminary results are presented at the Plant Molecular Cytogenetics in Genomic and Postgenomic Era Conference in Katowice, Poland, in September 2014 in a poster by Fabíola Carvalho Santos, André Luiz Laforga Vanzela, Trude Schwarzacher and Pat Heslop-Harrison. This entry was posted in chromosomes, Collaborators, Farming, Genomics, News, People, Research and tagged agriculture, biodiversity, Brasil, Brazil, breeders, breeding, cerrado, chromosomes, collaborations, cytogenetics, evolution, forage, genome, genomics, grasses, hybrids, Londrina, molecular cytogenetics, polyploids, retroelements, wild relative. Bookmark the permalink.